The four puzzles Peter's Black Hole, Magic Jack, IQube, and Chameleon Cube, are essentially exactly the same puzzle. They consist of a cubical cage in which there is room for 3×3×3 small cubes. There are only 26 cubes inside though, leaving one space so that the cubes can slide around. It is very much the three-dimensional equivalent of the Fifteen puzzle. The starting position shows silver stars on the outside facelets of the puzzle. The hole is at a corner, and the three exposed facelets at the hole each show one word of "Peter's Black Hole". The solved position will show only black facelets, except at the corner hole which again shows the puzzle's title. The other internal facelets all have coloured stars. One solved position shows a silver colour on each outside facelet. The second solved position has all the light green facelets on the outside, with a blue path traversing them and forming a closed loop. The third solved position has all the red facelets on the outside, again with a blue path traversing them and forming a closed loop. The final solved position will show a mix of red and green facelets. Some facelets have letters on them, and if you follow their blue path the letters spell out a hidden phrase. One solved position shows green on all outside facelets, in another solved position all outside facelets are red, and in the last solved position they are all yellow. In all three cases the hole ends in the middle of an edge of the cube, and the exposed facelets there will not match. 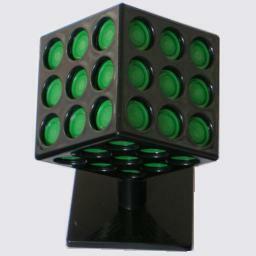 One solved position shows all green facelets, with the hole in the centre of the cube. A second solved position shows all red facelets, with the hole in the centre. The internal facelets also include yellow ones, and the packaging shows several other symmetric patterns of red, green and/or yellow that you can make, for example green with yellow dots on the face centres, or red with yellow dots in the face centres. The twelve patterns are shown below. This puzzle comes with a nice stand on which you can balance the puzzle on one corner. The facelets have different textures, and the puzzle was marketed as suitable for the blind, and some of the profits apparently went to the World Blind Union. 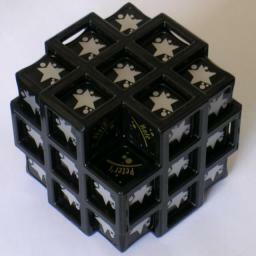 These puzzles differ from the Varikon 3×3×3 and Inversion in that the cubes at the face centres and in the centre of the cube can move too. The Varikon 2×2×2 is the 2×2×2 analog of these. There are 26 pieces and a space. For any position of the space, the 26 pieces can be in any even permutation. This gives 27·26!/2 = 5,444,434,725,209,176,080,384,000,000 or about 5.4·1027 positions. Overview article (pdf) from TwistyPuzzles lists the many types of sliding cube puzzles that have been made. I will not describe a full solution method here, as it is easy once you understand the simple technique for inserting a piece that is also used on the Fifteen puzzle. With that technique you can build up the solved position layer by layer, piece by piece. The main difficulty with these puzzles is recognising which piece is which. To this end I have drawn some pictures showing the inside facelets of each puzzle in the starting positions and the solved positions. Note that the internal planes of the starting position each have one colour. This makes it possible to identify any piece from seeing just three sides. In fact, if we ignore the six facelets with writing on them, opposite a silver star is a black facelet, and opposite a coloured star is another coloured star. In particular, if you see a piece with coloured stars on three adjacent faces, it must be the one that belongs in the centre. Also, the colours make it easy to orient your puzzle to match the orientation used in the pictures above. Note that because of this regularity, going from the starting position to the solved position involves moving nearly every piece to the position directly opposite. The only exceptions to this are two of the pieces with writing on them. Due to the parity constraint it is not possible to swap every piece with its opposite, which is why those two exceptional cubies are given an extra swap. I have written a program to solve this puzzle. It managed to show that it is not possible to go from the start position to the solved position in 118 moves or less (where a move is a shift of a single piece, and the centre piece is not moved). It is likely that the two positions are close to being antipodes. Using a different program, I found a sub-optimal solution of 150 moves. Start with the space at the upper back left (UBL) corner, and the piece with writing on opposite sides ("Peter's" opposite "Hole") at the back left edge. The following lists the directions the space is moved around the puzzle, using the standard abbreviations U,D,L,R,F,B for Up, Down, Left, Right, Front, and Back. You can read a general description of the techniques I used in the program on my Computer puzzling page, in the section on Multi-phase algorithms. I then changed my program to count each 'push' as a single move, whether it is one piece or two cubes in a row. The previous solution had 113 such moves. Also, I now allowed the program to move the centre by such a push as well. It found the following 105 move solution. Again, start with the space at the UBL corner, and the piece with writing on opposite sides ("Peter's" opposite "Hole") at the back left edge. The red solution exposes only silver facelets at the hole, and the silver solution exposes only red facelets. You can switch from red to silver or vice versa, by using the following move sequence, starting with the space at the UBL corner. In the green solution there are two silver facelets exposed by the gap, though the third facelet there forms part of the path of the solution. You can go from the green solution to the red by the following move sequence, starting with the hole at the DLF corner with the exposed green facelet on the FL piece. With the final solution the hidden phrase is "Train your brain with Magic Jack". This is visible on one path loop, but unlike the other solutions not all facelets are part of this path. If you find a way to arrange them on a loop that includes all the outside pieces, let me know. Unfortunately it is hard to know whether the orientation of your puzzle matches the orientation used in the pictures above. With the previous two puzzles it is obvious due to the coloured stars or the letters. 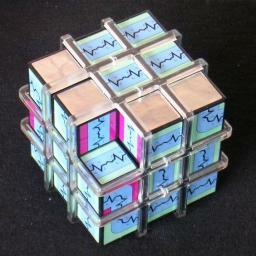 On the Chameleon Cube, the cage and the pieces have no obvious markings telling you which side belongs at the top or the front. 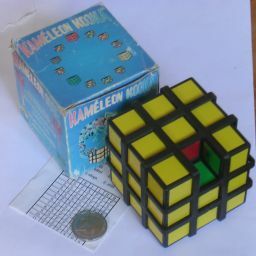 As with the Chameleon Cube, it is hard to know whether the orientation of your puzzle matches the orientation used in the pictures above, as the pieces and the cage have no obvious markings telling you which side belongs at the top or the front.